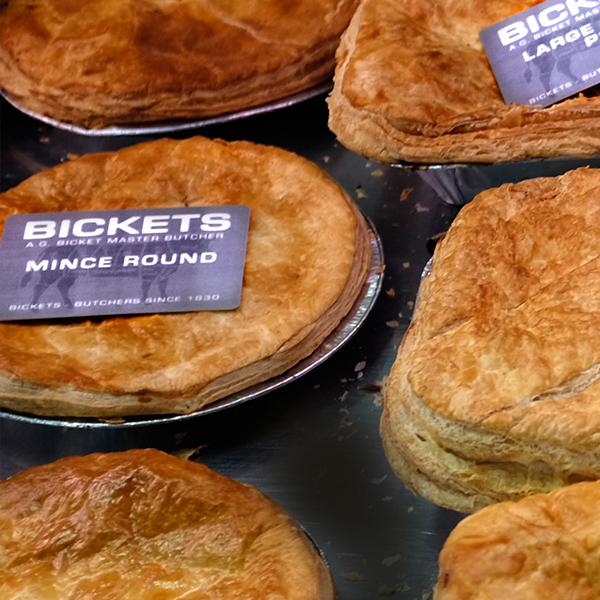 At Bickets, we make all our own steak pies, Scotch pies, curry pies and mince rounds in our Barrhead shop daily. There is a good chance this is why you have visited our website, they are by far our most talked about product on social media, in our first 2 years of opening we sold almost 8,000 steak pies and we like to boast about it!!! It was by no mean feat! Bickets was a newly established shop that opened around the same time as a brand new supermarket just across the road, 2 freezer shops along side our shop and other very popular butchers shops in all the neighbouring towns to us, who all serve up steak pies! We are proud of our pies and so happy our customers love them as much as we do! Bicket’s Steak Pies are made with scotch beef steak, stewed with our secret gravy! Available in individual mini size popular with our kids, 1/2lb, 3/4lb, 1lb and 1 1/2lb. We can specially make 3 & 4lb pies to order anytime of the year and are our most popular sizes during the festive periods. They sell out quicker than we can make them! 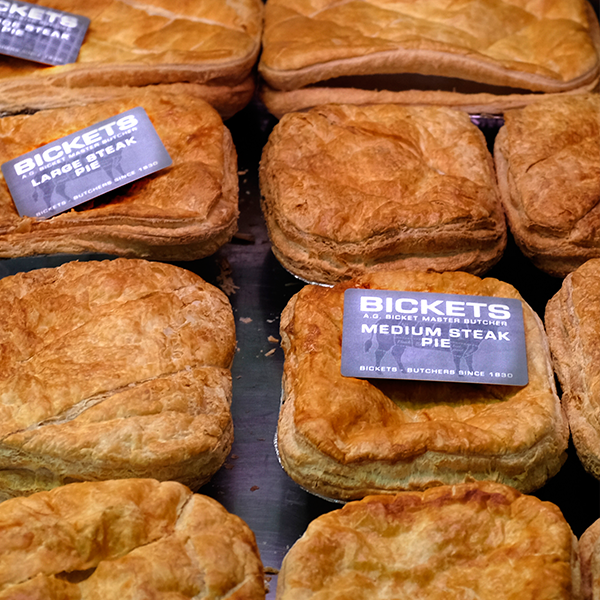 Bickets chicken curry pies are a scotch pie shell and puff pastry lid made with fresh chicken breast, onion and Yeungs curry sauce and baked to perfection in our shop… you may find when you arrive at our shop there are none left… they sell out quicker than we can make them! If you are heart set on them, best phone ahead to have up put some aside for you! 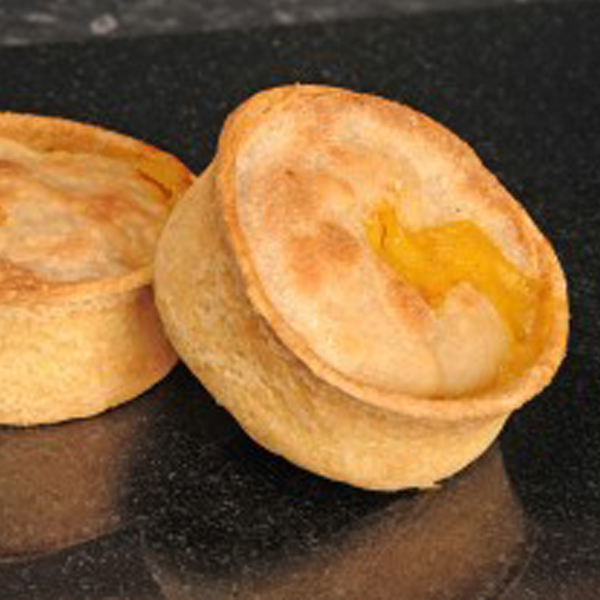 If you have never tried a scotch pie, then look no further! 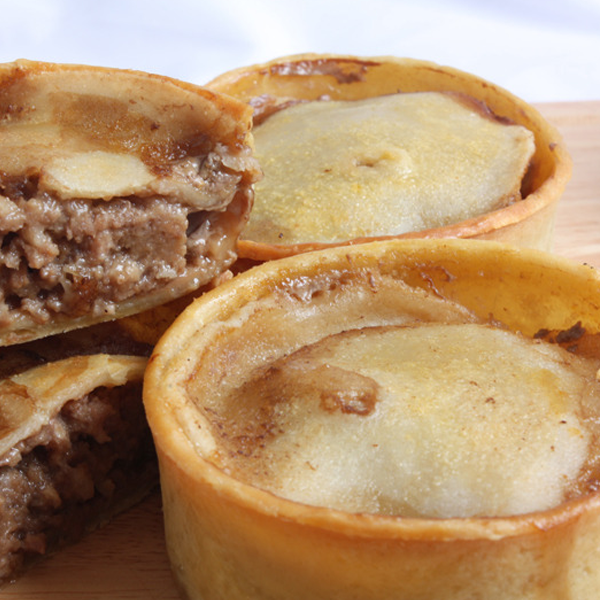 Our scotch pies are deep filled and absolutely sumptuous, if you have never tried a scotch pie, then look no further! If you do enjoy a scotch pie normally from one of the large bakers or supermarkets you’ll find that when you try ours, you’ll realise you have been missing out! Filled with our own lean steak mince and secret seasonings, there really is no comparison! Our mince rounds, are exactly that, lean mince and round! Bickets lean mince, secret gravy and a golden pastry lid… simple yet so so good! Serves 2/3 although Bickets cannot name names on our website, a few customers we know have been known to have one to themselves, and beans, and chips!